What sounds a bit disconcerting for the non-connoisseur is actually a local German specialty from the Pfalz region that even statesman like Margaret Thatcher, Michail Gorbatchew, Francois Mitterand and Ronald Reagan were to indulge. In fact Germany’s former Chancellor Helmut Kohl is a big fan of the specialty and traditionnaly invited all his stateguests to a restaurant were his beloved Saumagen is celebrated with pride. But what is Saumagen? 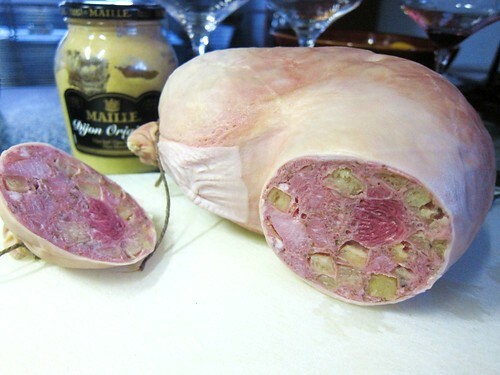 Literally translated it means “Pig’s stomach” but like a sausage, the stomach is only used as a wrapper for its filling. So it’s all about the filling. Originally, Saumagen was a poor man’s dish which used the butcher’s leftover cuts. Nowadays things luckily changed for the good and the filling is actually very appetizing: lean pork meat, various herbs and spices, Bratwurst filling as well as diced potatoes. The Saumagen is boiled like a sausage by the butcher and sold. At home or in restaurants it is sliced and pan fried, then served with Sauerkraut or mashed potatoes. So back to the restaurant our elder Statesman Kohl loves: it is named Deidesheimer Hof and is located in the small village Deidesheim which every German Riesling-lover knows. 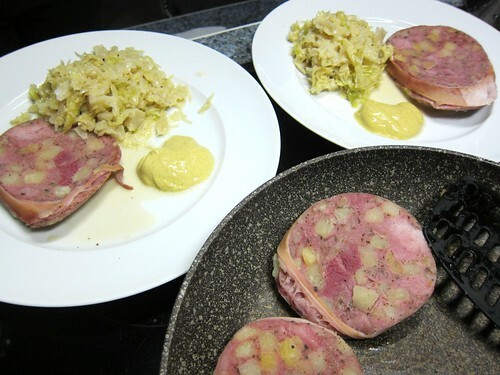 When it comes to Saumagen though, the restaurant is closely linked to a butcher in nearby Wachenheim where Kohl buys his Saumagen for his own use: Klaus Hambel. And that Saumagen I sliced up miyself actually stems from Klaus Hambel. 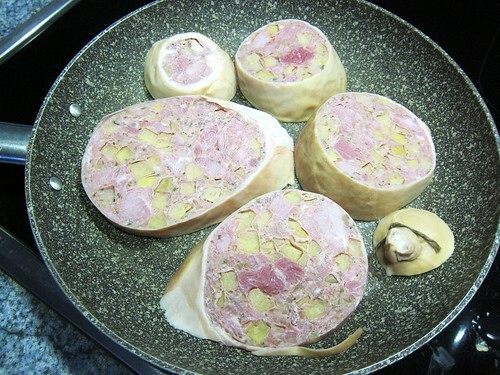 It is way too easy to prepare it: brown it a bit in a pan, serve it with mustard and a glass of Riesling. For the side I decided to prepare Savoy Cabbage in cream. A successful pairing! Hi Alex…we were recently in Wachenheim…report on the blog…Zimmerman Apples…and drove by the butcher’s you mentioned. It was packed out on a Saturday midday…and as we had lunch in mind…we had no time to wait and buy anything. I read your article already! Haven’t been to the region for a while, except for the Wurstmarkt, but no fine drinking involved there! Ardèche Belgian Wine Bukit Bintang Chateau D'Aiguilhe Chow Kit Market Domaine des Enfants Eneko Atxa Francois Carillon Fronsac Gatao Haardter Bürgergarten Italy Jumilla l'R Landhotel zum Bären Nafplio Pho Bo Restaurant Lohninger Rosé Ruppertsberger Linsenbusch Sherry Tacos Thomas Pfaffmann Traiser Val Sotillo Viura Wayne Gretzky Weingut Pflüger Weingut Stadt Krems Weingut Zehnthof Luckert Weissburgunder Wesley Genovart Winepunk!